I love Alice in Wonderland. I've loved Alice in Wonderland since before loving it was cool, haha. That was one of the only kids' movies we owned growing up (we would rather have rented), so I saw it upwards of 50 times, no joke. 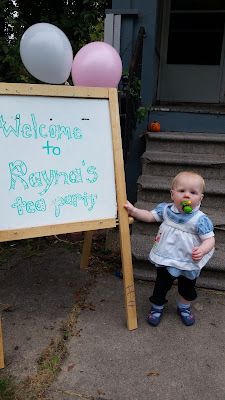 So, when I was trying to decide on a theme for my daughter's first birthday, it was only natural that an Alice themed tea party would strike me as appropriate. The cutest, most appropriate, invitations ever! 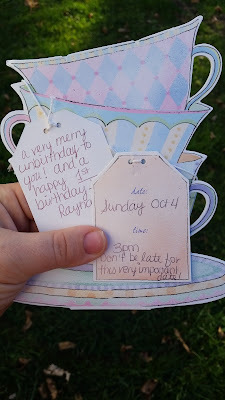 I added little AIW details like the party time: 3pm, don't be late for this very important date. 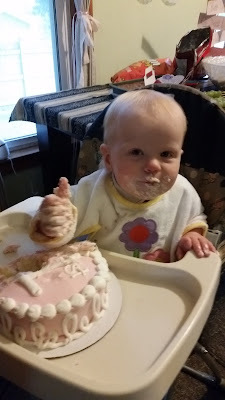 And the event: a very merry unbirthday to you and a happy first birthday to Rayna. I tried not to go all out though and stress myself out. I wanted it to be about celebrating my little girl, not an over-the-top obligation. Kayne's first birthday party didn't even have a theme, and I'm not sure they're completely necessary. But I guess I was strung along by all the other mommas in my mommy groups that had set themes and picture-worthy decorations. You know how that goes... We wanted to keep it simple. Hubster and I definitely committed to easy food. The crockpot, some veggie trays and grape skewers were very easy food choices that took the pressure off. We really did serve tea too and set out a beautiful teacup collection from my mom. 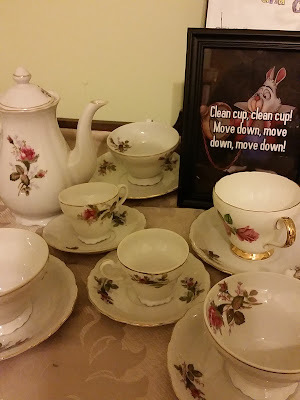 Clean cup, clean cup, move dooooown! For some reason, my mom also had some tea party themed balloons in her party stash which couldn't have been more perfect. 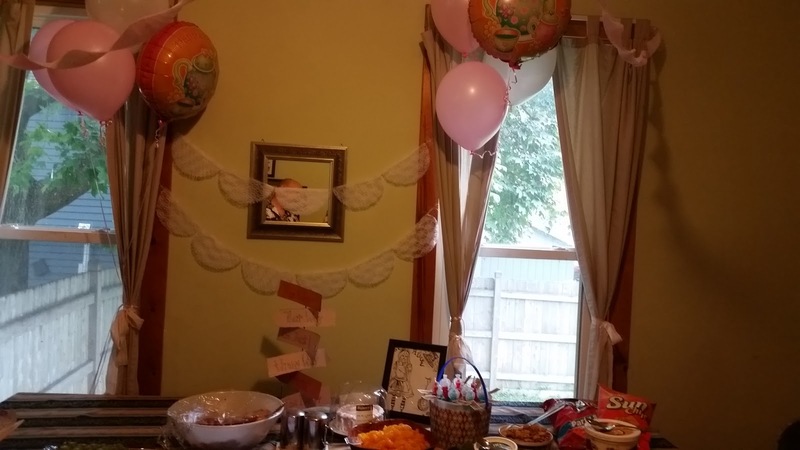 This pic isn't the greatest, but we used the balloons, a doily bunting banner and a few hand-drawn (by my sister) Alice pictures for decorations. I forgot to get a picture of it up close, but I made a sign at the center bottom there that had arrows pointing "this way," "that way," "wrong way," "tea party" inspired by this Pinterest post. 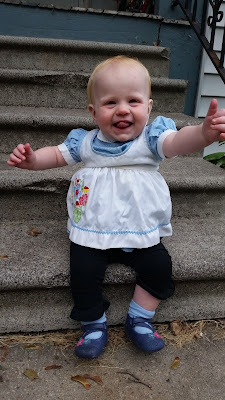 I found the most adorable Alice dress from an Etsy shop for the pretty lady, although I'm not sure the 12 month size was accurate. She sure made an adorable Alice. 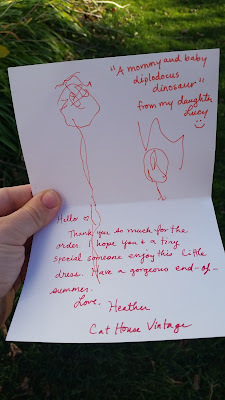 And the most adorable card from the seller certainly made up for it. 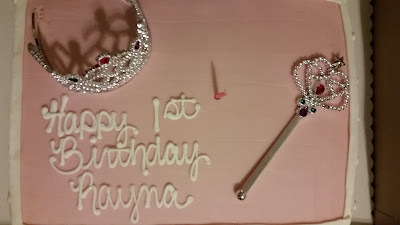 We couldn't find a tea party or Alice in Wonderland cake at the grocery stores we tried, so we settled on a generic princess cake, that even came with a complimentary smash cake. And smash it she did! This kid was totally asking for it, lol. 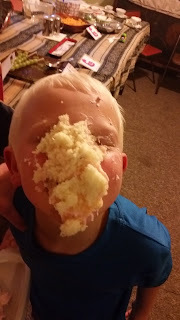 Like literally, "throw cake in my face, momma" asking for it. All in all, Rayna did pretty well for all the noise and ruckus in our house. I loved it! 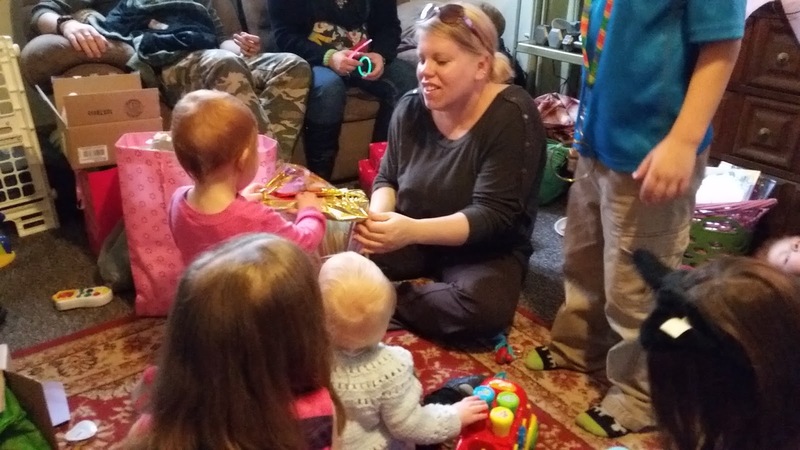 Our house was filled with our closest family and friends. Especially ones I hadn't seen in a long time. I love having a full house! It had to be overstimulating for the baby, but she hung in there and begged us to open her new toys in her own baby way: by bringing them to us and whine-crying to get her point across. So darling! 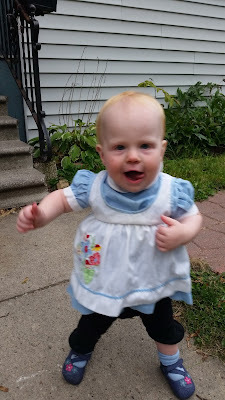 We had a fabulous time ringing in this milestone day with our pretty little daughter (it's still weird for me to say "daughter." I have a daughter!). She's finally one! She finally has a number! I'd like to thank all my friends and family that were able to make it. You know who you are! We couldn't have made Rayna's day so special without you. These precious moments will be captured in her memory book forever and we're so glad you were a part of it! Such a great party idea and Rayna looked so happy. Happy belated Birthday to a beautiful little girl. 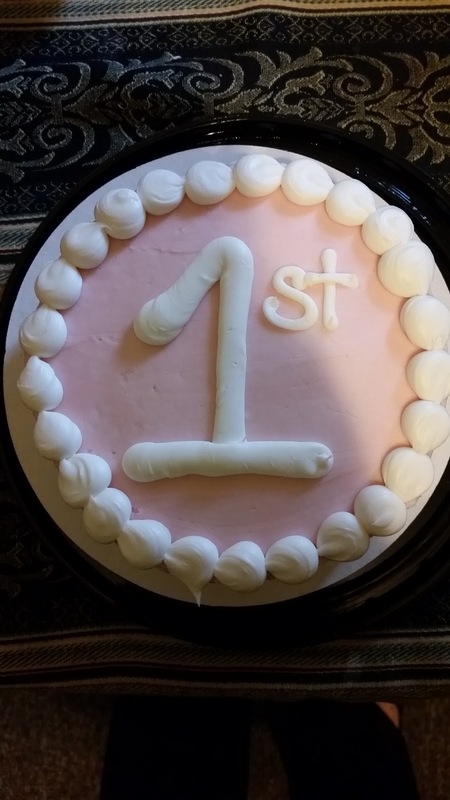 Good job on the party Mom! 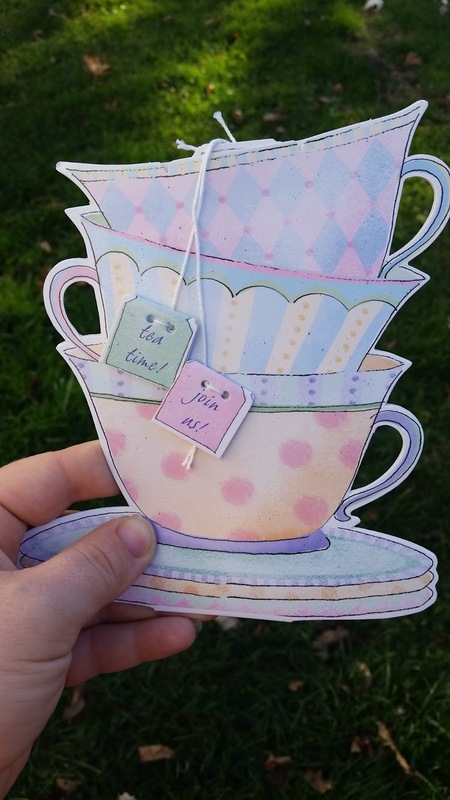 Truly you have used amazing and lovely ideas to make your Tea party unique. 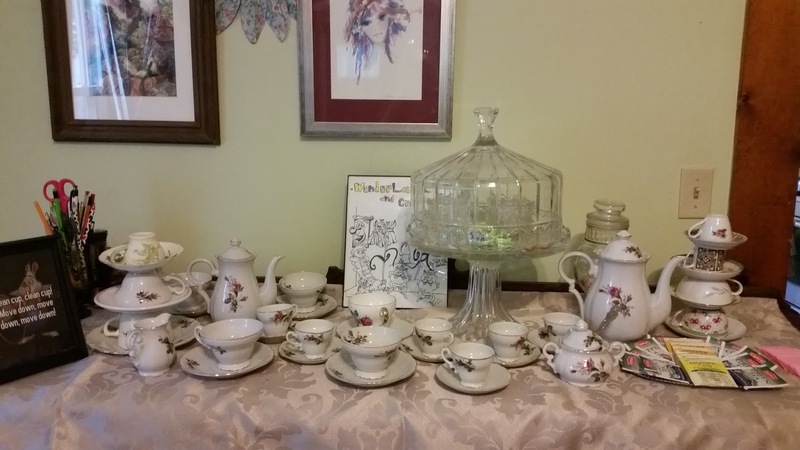 I just loved your tea sets too. How cute this little angel is!! Well this week I am going to throw a grand party at event space nyc on my sweet daughter birthday. I will order such yummy cake for her birthday. 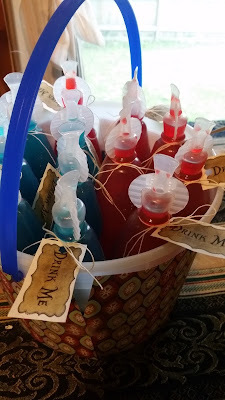 Thanks for stopping by the blog Dianna! It was a great time! 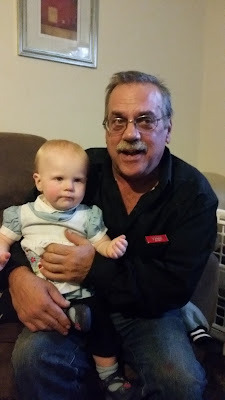 Mackyton, happy birthday to your little girl! I hope you have an amazing time! 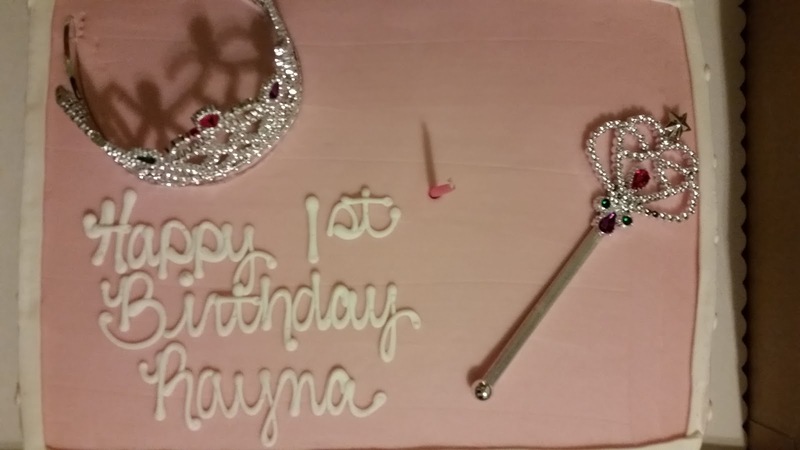 Your daughter is looking very cute in these lovely pictures from her birthday celebrations. 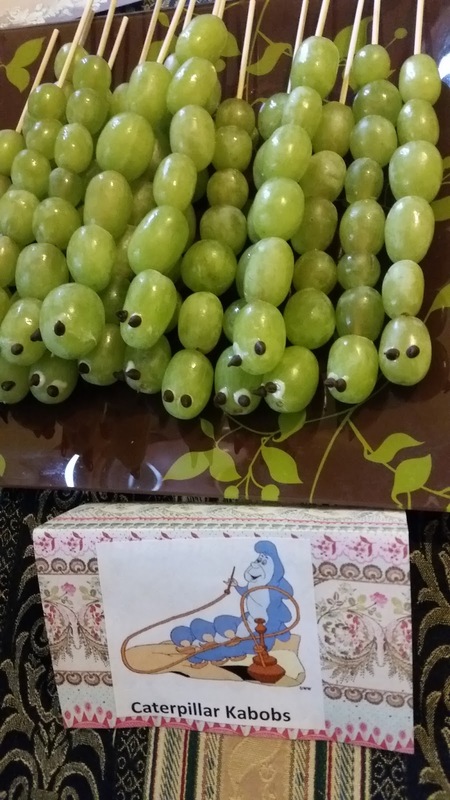 The theme was great and the decorations and food arrangements were also amazing. Let’s hope that I will also be able to organize an enjoyable party for my daughter’s birthday next week at one of the famous Los Angeles event venues.